Photographer David A. Land, and author, Rumaan Alam, had an issue. The couple had two growing boys, Simon and Xavier, and were in need of more space. So, they moved, uprooting from Fort Greene, to Crown Heights, a neighborhood known for beautiful historic architecture. And then, they went to work. 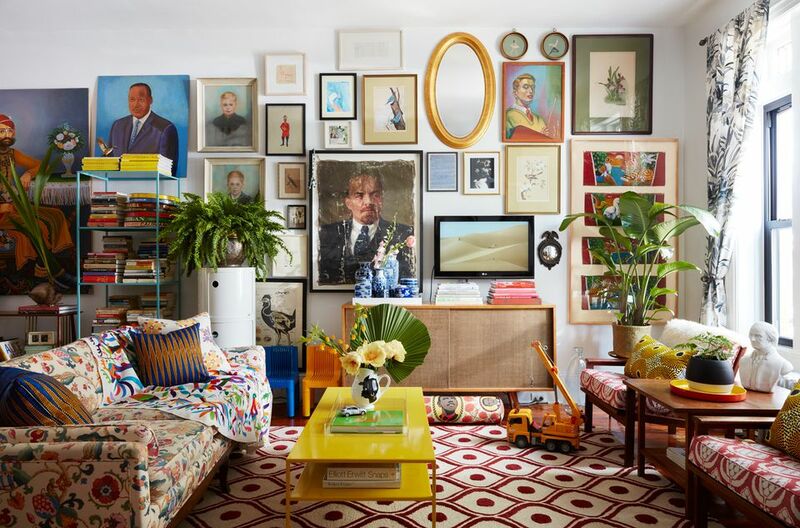 Both lovers of design, Land and Alam designed a home filled to the brim with art, color, pattern and layers of beautiful cultural elements, in addition to plenty of creative spaces for their boys to grow and flourish. The interior has an absolutely beautiful color palette. In the living room shades of crimson, yellow and green effortlessly come together. It's clear that the family has a love of global textiles, with the sofa featuring a gorgeous suzani print, topped off with a mix of Dutch African wax print pillows. Beyond the stunning gallery wall, featuring paintings of Dr. Martin Luther King, Jr., and collected pieces from Bangladesh, one of our favorite elements in this room is the bolster featuring President Obama. The melange of cultures is something that truly makes this family home stand a part. In every room, there are beautiful collections and pieces from far-off places, as well as favorite local haunts. On the sofa, pillows from local Brooklyn boutique xNasozi, sit beside otomi fabric picked up during travels to Mexico. Behind the sofa is the home's library. Alam is an author, so it's no surprise that this home has an incredible book collection. A colorful array of favorite reads sits on turquoise shelving. Among art and collected objects, it's the perfect place to showcase a love of literature and reading. Every vignette is an opportunity to showcase the family's beautiful collections of objet d'art. Framed by colorful lighting and the backdrop of Voutsa's Ballets Russes Mini wallpaper are family heirlooms, including a selection of bird prints that once belonged to David's grandfather. In the dining room, a colorful hot pink table is the ultimate statement piece. It's surrounded by a collection of Paul McCobb dining chairs, a designer that the couple clearly loves, as mid-century pieces by McCobb can be spotted throughout the interior. Land and Alam make every space count in their home. Whether a console, a shelf, or even the bar, meaningful objects can be found throughout. Among the beautifully styled pitcher and spirits, a papier-mache bust of Jean-Jacques Dessalines, the leader of the Haitian Revolution, is an unexpected piece of art. The home office is an inspiring space, with a mix of vintage furnishings and contemporary art. A streamlined parson desk fits perfectly with a vintage chair that belonged to Land's grandfather. Above the desk, a vignette of original art, including a piece by Brooklyn-based painter, Jas Knight. This home is filled with some of the most stunning collections. Atop a tray is the couple's antique collection of blue and white chinoiserie porcelain. This Brooklyn interior is also home to an abundance of plant life. In the kitchen, hanging plants and a healthy ficus are the perfect accessories. 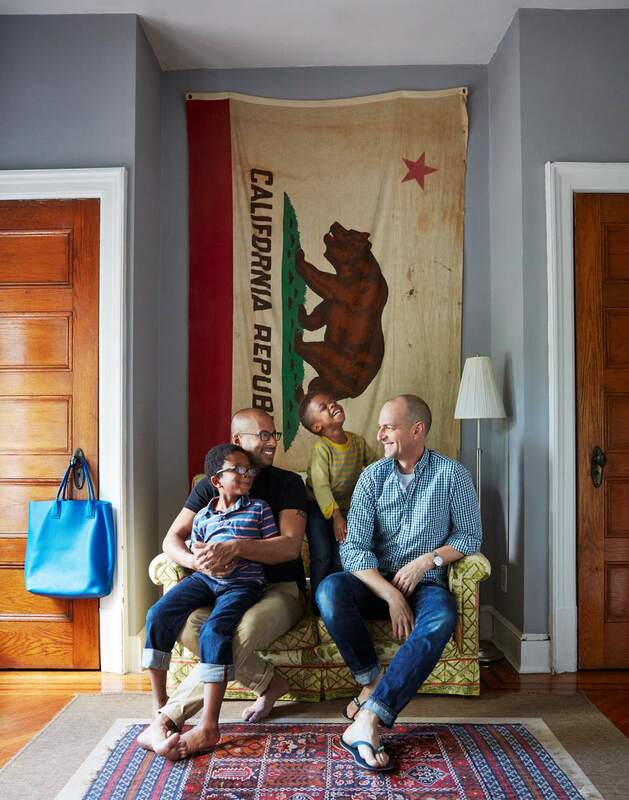 With two young children, these two fathers have also carved out creative space for their boys. In front of the mantel, an easel is a great way to get creative energy out. Beyond the upholstered cabinetry are even more books to be explored. A campaign dresser is another vintage treasure in this Brooklyn home. Topped with a bright yellow pineapple lamp, it's a whimsical moment in a home with kids. The home has classic bones, including original stair rails, a gorgeous wood mantel, and wood paneling that can be found in the dining room. Upstairs, the master bedroom is a peaceful oasis. Palm leaf bedding is the perfect pop of color among the deep, gray walls. Tucked away in the corner is a side chair upholstered in a beautiful chinoiserie fabric. It's a complement to the many bird prints and the chinoiserie collections found in the home. For the boys room, bunk beds are extra fun. To soften the hard lines, Indian kantha bedding adds a layer of color and pattern to the space. And the color story continues in the kids' room, with a green statement wall featuring Green Leaf wallpaper from Chasing Paper. A yellow dresser enhances the bright vibe of the space. And on top of the dresser, special pieces for these two brothers featuring Martin Luther King, Jr. are on display. This one-of-a-kind family home is sure to keep this growing family happy for some time.